Pope from 1572 to 1585; born at Bologna Feb. 7, 1502; died at Rome April 10, 1585. His attitude toward the Jews was that of a man possessed of natural goodness warped by strong feelings of intolerance and fanaticism. 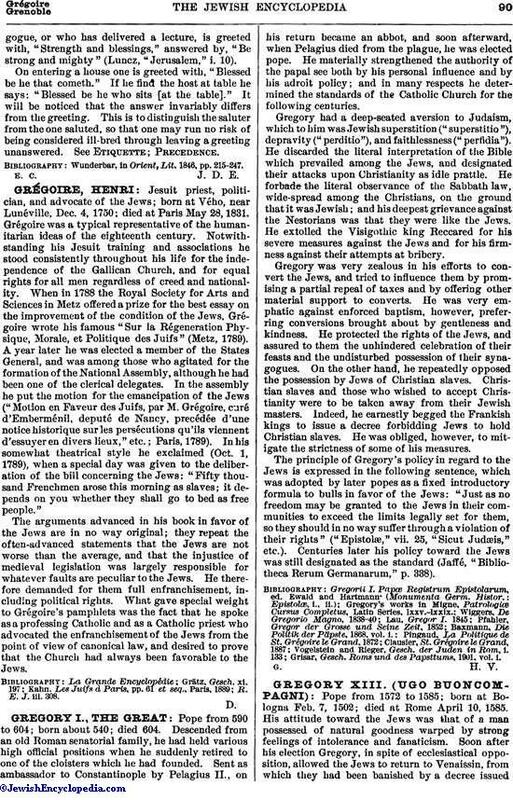 Soon after his election Gregory, in spite of ecclesiastical opposition, allowed the Jews to return to Venaissin, from which they had been banished by a decree issuedFeb. 26, 1569. Like Paul III., Gregory granted (1581) safe-conduct to Jews traveling through Italy; he also repealed the prohibition against interest. By a writ issued Jan. 10, 1577, he confirmed the regulations of Clement VII. which organized the community under a council of sixty, and he sanctioned a system of communal taxation by which each member was assessed according to the degree of his prosperity. Gregory, however, was the author of a series of bulls and ordinances of the most hostile character. 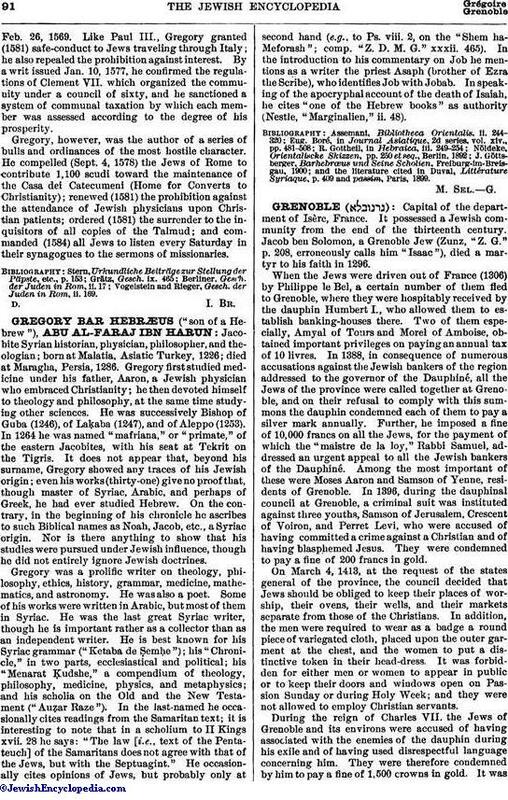 He compelled (Sept. 4, 1578) the Jews of Rome to contribute 1,100 scudi toward the maintenance of the Casa dei Catecumeni (Home for Converts to Christianity); renewed (1581) the prohibition against the attendance of Jewish physicians upon Christian patients; ordered (1581) the surrender to the inquisitors of all copies of the Talmud; and commanded (1584) all Jews to listen every Saturday in their synagogues to the sermons of missionaries. Vogelstein and Rieger, Gesch. der Juden in Rom, ii. 169.